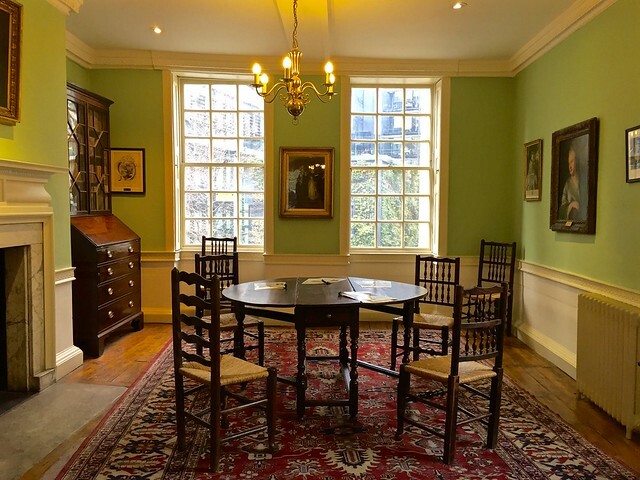 Visiting Dr Johnson’s House is a bit like going round a house you’re thinking of buying – it’s such a nice size, so well laid out, so conveniently situated, that you almost feel like making an offer there and then. But chances are it’ll be out of your range. 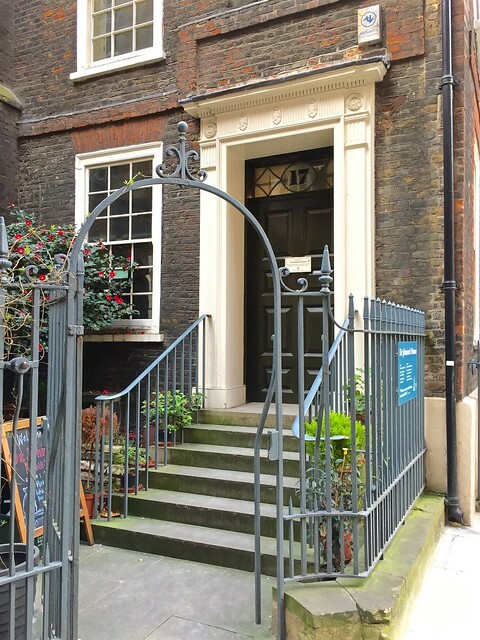 That convenient location is right in the centre of London, just off Fleet St and the house, built at the end of the seventeenth century, is Grade I listed. Still, we can dream, can’t we? 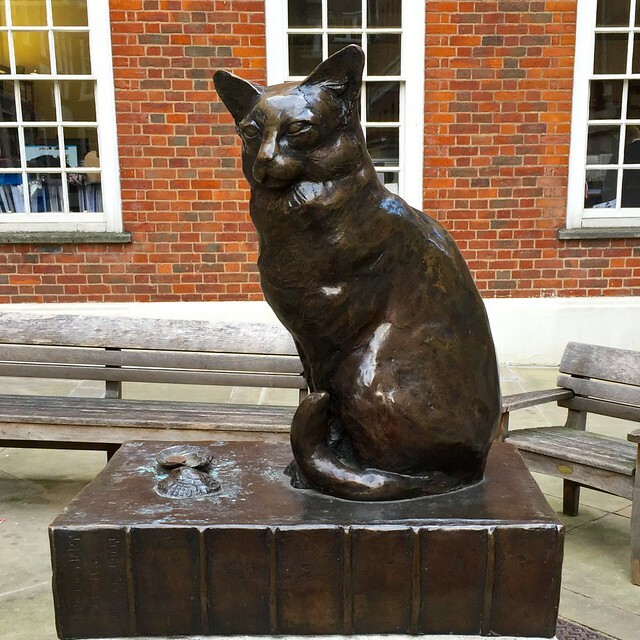 The house is tucked away in a quiet little square reached by a series of alleyways from Fleet St.
Across the square is a statue of Dr Johnson’s cat, Hodge. He sits next to some empty oyster shells; Dr Johnson’s biographer, Boswell, reported that Dr Johnson would go out himself to buy oysters for Hodge so as to save his servant the embarrassment of doing it. (Oysters were cheap in those days). The house is smaller inside than you might expect because it’s only one room deep, so all the rooms face out onto the square. You enter via the side door – the big main entrance, with its fearsome chain to keep robbers out, stays closed. On the ground floor is the shop and the little parlour. 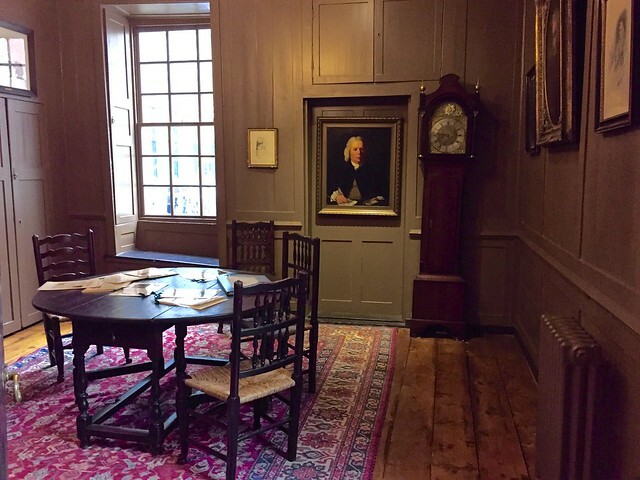 The panelling is original and the room is hung with portraits of Dr Johnson. On the first floor are two rooms, one of which was probably the bedroom of Dr Johnson’s friend Anna Williams. The other, the Withdrawing Room, would have been used by ladies when they left the gentlemen to their port after dinner. 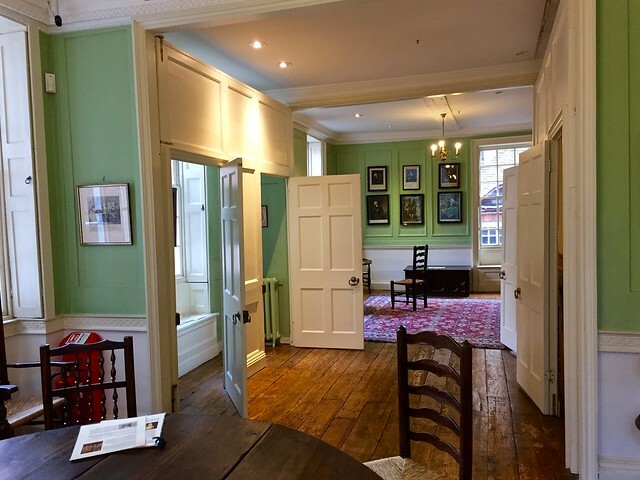 An ingenious arrangement of panels and doors between the rooms means they could be opened out into a single room when there were many visitors – Dr Johnson was a sociable man and the house was often full of his friends. On the next floor is the library, though it would probably have been a bedroom in Dr Johnson’s day. Though Dr Johnson owned some three thousand books when he died, only three of the books in the current library belonged to him. 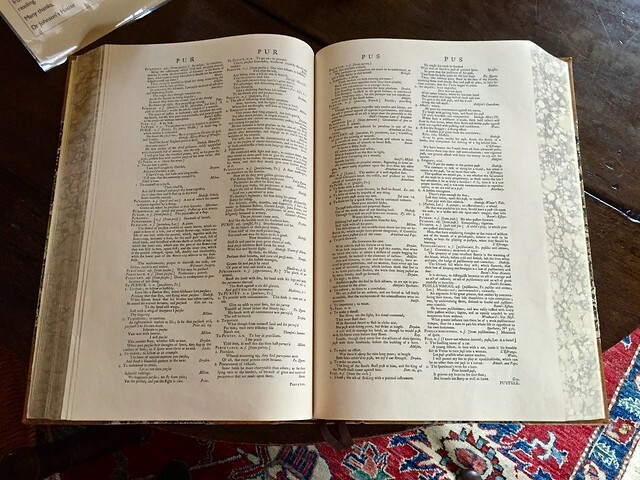 On the table there’s a facsimile of Dr Johnson’s famous dictionary. He was commissioned to write it by a group of booksellers in 1746 and was paid 1,500 guineas, a massive amount in those days. It was published in 1755 and remained the standard reference work for a hundred years. It sold for £4 10s, the equivalent of £350 today. 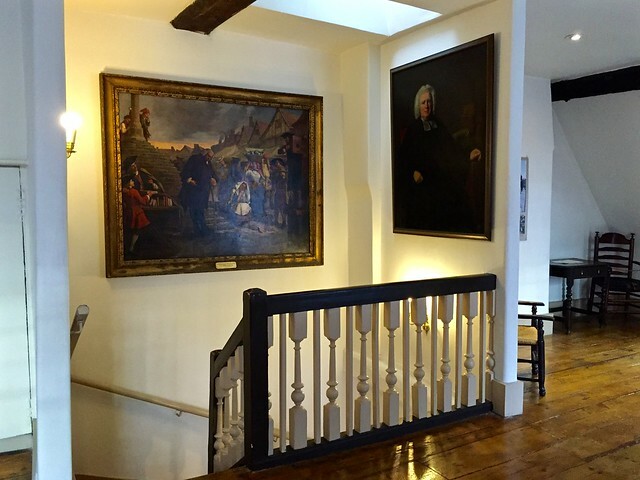 On the next floor, under the eves, you find the garret where the work of compiling the dictionary was carried out by Dr Johnson and a team of assistants. It’s nice to think of him living in this cosy house surrounded by his friends, enjoying all that eighteenth century London had to offer. 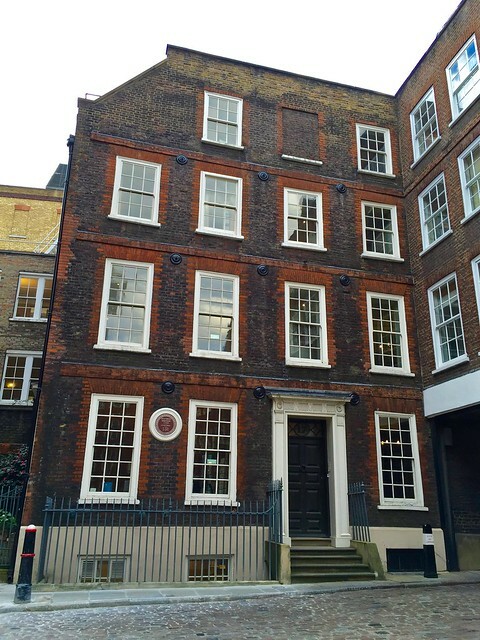 Dr Johnson’s house is at 17 Gough Square. It’s open October to April, Monday to Saturday, 11am to 5pm and May to September, Monday to Saturday, 11am to 5.30pm. Adult entry is £4:50. 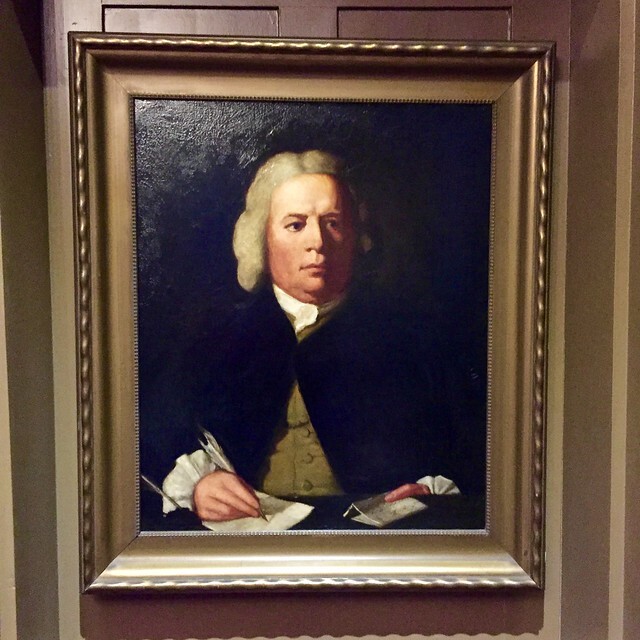 This entry was posted in Historic Houses and tagged 17 Gough Square, architecture, arts, Dr Johnson, eighteenth century, history, Hodge, Johnson's dictionary, London, tired of London by Fran. Bookmark the permalink. Loved the cat. In my case when I was tired of London I moved to Tuscany, however! Some of us never get tired! This is so lovely. I decided yesterday that I am going to be in London next week on business so if I have spare time, this might be the thing to do. It’s a good place to visit if you don’t have much time because it’s small and central. 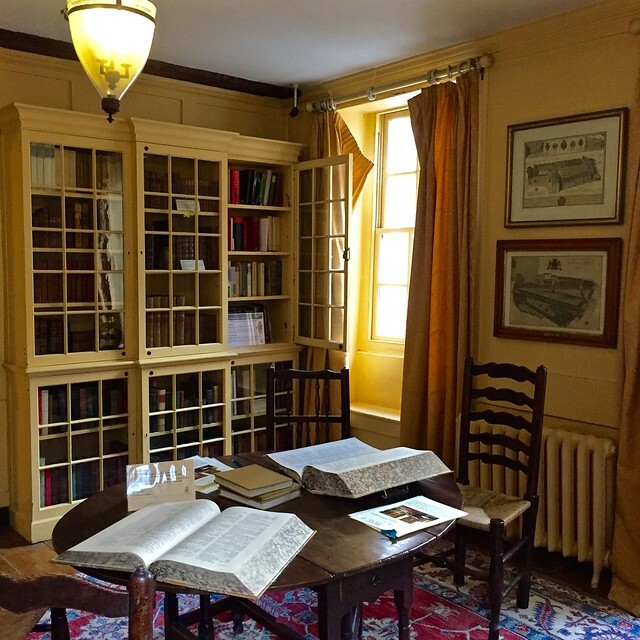 This year, for the first time, I read Boswell’s Life of Johnson, listened to an Audible Audiobook of “The A-Z of Dr Johnson”, and visited Dr Johnson’s house. Enjoyed all of them. Thanks for telling us about the house. Wow, you’re a Johnson expert now! Indeed – but then I’ve got books to sell, so I think I’m in the clear! Good point. I hope the books are selling well. I haven’t read the Bullet Train Murder yet, but the others have been great.